We find ourselves thrown into the midst of an apocalypse, which is perfectly ok with Boku Slots because we love a good zombie game. 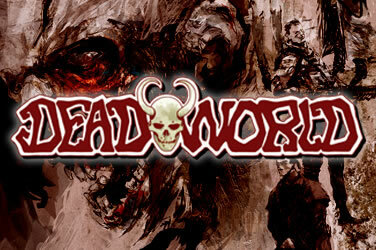 Dead World is based on the comic series originally created by Caliber Comics. The idea was then reimagined by 1x2Gaming and turned into a particularly gory looking slot game. But will it stand the test of time and grab the hearts (or brains) of the zombie loving players in the slot world? Dead World is a 5-reel and 50 fixed pay lines in play game, offering an RTP of 95% to its players. The graphics are gruesome and gory, as are the sound effects. The reels drop to what sounds like gun shots and there are zombie noises, sounding like they are right behind you at all times. At this point though there doesn’t seem to be much else to the graphics. There are no additional animations or clips which would make the game that little bit more immersive. 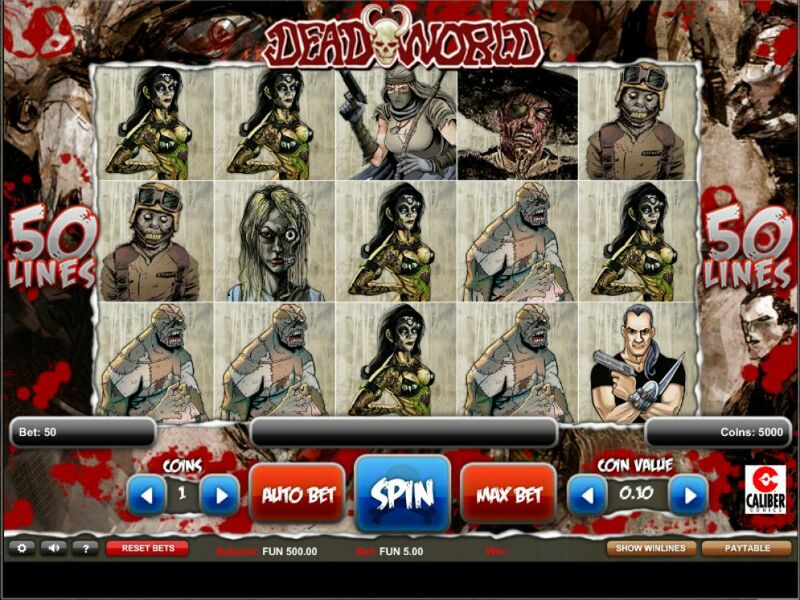 Bet Amounts – Betting on Dead World begins at 50p per spin making it just 1p per line in play. However, you can adjust the coin amount and the coin level, giving you a wide choice of bets to suit all pockets. So, the 50p bet begins at coin amount 1p and coin level 1, but if you click the bet amounts on the screen you will be given a sliding reel going up to coin level 5 and coin amount 50p. This makes your maximum bet £125, so as you can see there is a huge range of bets available between the lowest and highest. Just be sure you have adjusted the scales according to your current balance and limits, before hitting spin. Wild Symbol – The wild symbol in Dead World is depicted by a woman dressed in white, with her head wrapped in bandages. She also has the word wild written across the front. It will substitute for all other symbols except the bonus and offers no other win potentials, so be aware of this. Bonus Symbol – Land three or more of the scary zombie bonus symbols anywhere on screen and you will trigger the bonus feature. You will also be awarded an additional win for three or more bonus symbols if they form part of a winning combination, with the maximum of a 300 coin win for landing 5 on an active line. Other Symbols – All the symbols in Dead World are the characters straight out of the comic book series and as such are a range of the undead with the odd surviving human here and there. The highest paying symbol in the game is the skeleton and this will pay out a whopping 500 coins if you land five on a winning line. Bonus Feature – Once you have triggered the bonus feature by landing three or more of the scary zombie symbols, you will be taken to another screen. Here you will be given two rows of zombies resembling a tin can alley style shooting range. Click on the zombies to win a coin prize or extra shots. This can work out quite a lucrative bonus round if you managed to extend it by hitting the zombies with the extra shots on. The prize is allocated randomly so it doesn’t matter where you hit the zombies, as long as you hit them. Now for us Dead World is quite high up on our list of great zombie themed slots. However, there could have been a lot more done with this to make it our number one. That being said, the bonus round was brilliant, because there’s nothing better than a shooting range full of zombies. Let’s not forget that the pay outs came quick and often too, making it a good go to game when you want quick returns. Overall, a well designed and graphically entertaining game and we can see why players seem to be flocking to it time and again.